I want to talk about three guys, two of whom have been extremely important in the Dominionist movement early on and one who also holds sway over hundreds of thousands through his media programming. There are so many people we could talk about and because of my understanding of Dominionism, I now realize why they believe what they believe and how they came to believe it. Unfortunately, as I’ve previously mentioned, even if we try to limit our discussion to just the main people, we’re still talking about quite a few people and that would be anti-climactic, frustrating, and a bit tedious. If I fail to cover a person that you know to be well-known within Dominionist circles, remember that they all have the same general agenda and ultimate goal. How they get there may be different from one to the other, but none of that matters to them. They can appreciate one another’s differences while still believing that they all are moving toward the same united goal. 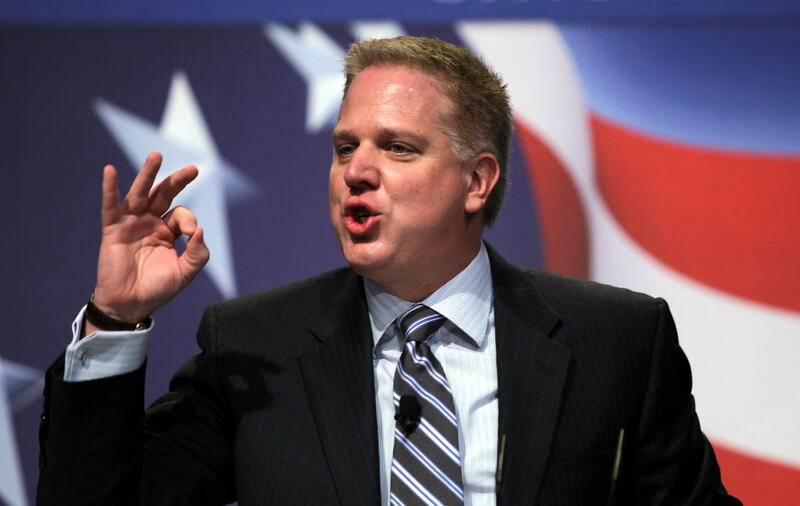 Recently, Brietbart published an article about Glenn Beck and his predication that Donald Trump is going to be the next president of the United States. Hello, America. I’m going to make a prediction about Donald Trump. I could say he’s going to be the nominee of the Republican Party. But I think that’s obviously a foregone conclusion. Here’s my prediction, and I stand by it: Donald Trump is going to be the next president of the United States. Those were words from Beck. He stated on his own website the following. Beck presents his reasoning, but I’m more interested in what he actually does not say. He does not state that he believes Trump is God’s “anointed” as numerous so-called “prophets” are doing today. If Beck said that, he would going too far and entering the land of the lunatic fringe, but of course many think he’s already there anyway. No, Beck has to keep his reasoning political, not spiritual. So Glenn Beck has officially come out and stated that Trump is going to be the next president. His explanations as to why he thinks Trump is going to beat Hillary are not that solid in my opinion. In fact, they are somewhat milquetoast, which also makes me believe – based on his past associations (including Mormonism), that he is a Dominionist, but probably wouldn’t be willing to admit that to anyone. Read them yourself at the linked articles and see if you arrive to a different conclusion. Beck really isn’t saying all that much but it certainly sounds more reasoned than simply coming out and saying that Trump is God’s “anointed,” doesn’t it? I don’t believe Trump will be our next president. I believe he is in the race to act as a dividing force in the GOP so that more people will vote for Hillary Clinton. However, having said that, even if Trump becomes the next president, nothing will change in Washington. Trump won’t manage to accomplish any of his campaign promises, but like Obama, he would offer excuses as to why he couldn’t do what he really wanted to do. He won’t build a wall. He won’t take on “illegals,” he won’t do this or that because it is the Elite who control the political process in America and have done so for years. This is why so many of them – in spite of their illegal activities – are so well-protected. Let me also say that this continues because God allows it, not because He is powerless and desperately needs the Church’s help to right the wrongs. I’ve stated this repeatedly but I’ll say it again. If we take the Bible literally (not literalistically), it teaches that evil will continue to grow and gain more and more control over the earth. This will happen until such a point where Satan’s spiritual son (Antichrist) becomes the ruler of the world (Daniel 2; 9, etc.). Once this is accomplished, Satan will be the ruler of the world, something he promised himself eons ago (Isaiah 14:14). God has simply given Satan the freedom and leeway to make that happen, but it will not last. But why? Why has God allowed and continues to allow Satan to grow his evil empire so that one day, he will actually rule this world (through Antichrist)? Why has God allowed this? For the simple reason that when Satan actually becomes ruler through Antichrist, Satan’s defeat will be seen not only in the spiritual realm (as happened at the cross), but will be seen throughout the world! The entire world will see how easily God in Christ defeats Antichrist (ergo Satan) during His second coming to this earth! The entire Creation will understand once and for all that God is God and is fully sovereign. Satan has been a pretender the entire time! In the final analysis, though Satan will rule the world, he will still not become “like the Most High.” It’s an impossibility, but God will allow him the opportunity. This is what has been happening since the Fall (Genesis 3). In the meanwhile, Satan has been working diligently to get Christians to believe that at least part of their job (if not all of it) is to “possess the nations” for God. It is one thing to rely on any rights you might have under the Constitution and to avail yourself of those rights if/when the time comes for that. However, it is quite another to use all tactics available (including deliberate lies) to create a fear-induced society that believes it will be overcome by evil if “good people” don’t do something. The focus for that person shifts from personal evangelism to national salvation, yet there is no such thing in Scripture unless we’re talking about Israel itself! The job of each and every Christian is to be concerned for, to pray for, to witness to each and every lost person that comes across their path. God will allow no one to die without embracing salvation who really wants it even if we fail in the process. Satan’s preference however, is that we replace personal evangelism with national salvation. While this may sound good, it is not Scripturally based at all that I can see without taking parts of the Bible allegorically. I’m sure we’re going to hear more and more “conservatives” coming out of the woodwork – especially from the “signs and wonders” crowd – assuring us that Donald Trump is going to win the next presidential election. Others will confirm to us that he is God’s “anointed” man for the hour. Apparently, God was way too impotent to keep Barack Obama out of office though. Apparently, God’s hands were tied when it came to prosecuting Lois Lerner and the other liars in federal agencies. Apparently, God has no ability to do anything about Hillary Clinton’s complete lack of ethics. Really? Go back and read how God dealt with Pharaoh. At times, Pharaoh hardened his own heart and at other times God hardened it. Why? Simply because God wanted to prove His sovereignty and chose to use Pharaoh to accomplish it. But His sovereignty often looks different from what we personally want to see, doesn’t it? Why? Because God is very much interested in saving individual lives of people who desperately need His salvation. Let’s stop here and actually begin to deal with Rushdoony and North in the next article rather than start here in this one. Join us then. Entry filed under: christianity, Cultural Marxism, Emotional virtue, eternity, Political Correctness, Politically Correct, Religious - Christian - End Times, Religious - Christian - Prophecy, Religious - Christian - Theology, salvation, second coming. Tags: dominionism, donald trump, gary north, glenn beck, john rushdoony.